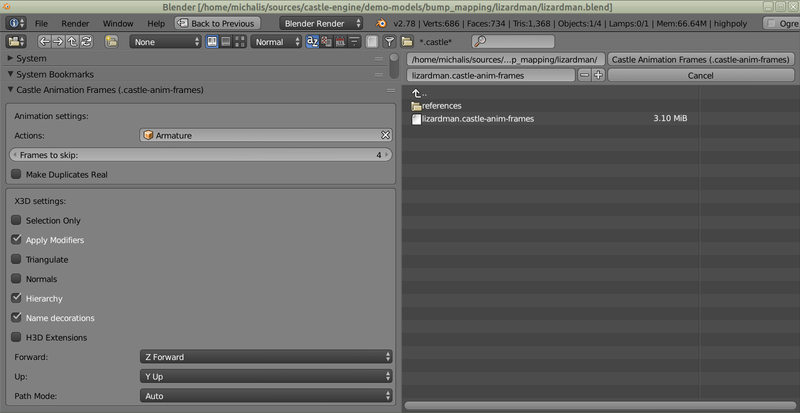 Files with extension *.castle-anim-frames (older version: *.kanim) represent "Castle Game Engine's Animation Frames". More information about exporting animations from Blender is available here. White Dune also can generate *.kanim files from an VRML animation by interpolators. The format is a series of static 3D frames. They can be inlined in a large XML file (in which case they must follow X3D XML encoding), or they can be external files (in which case they can be any 3D format supported by the Castle Game Engine). Animation shows the transition from the first frame to the last. Where models are structurally equal, intermediate frames are created by a linear interpolation to show smooth changes. All the advantages and disadvantages of this format come from this simplicity. 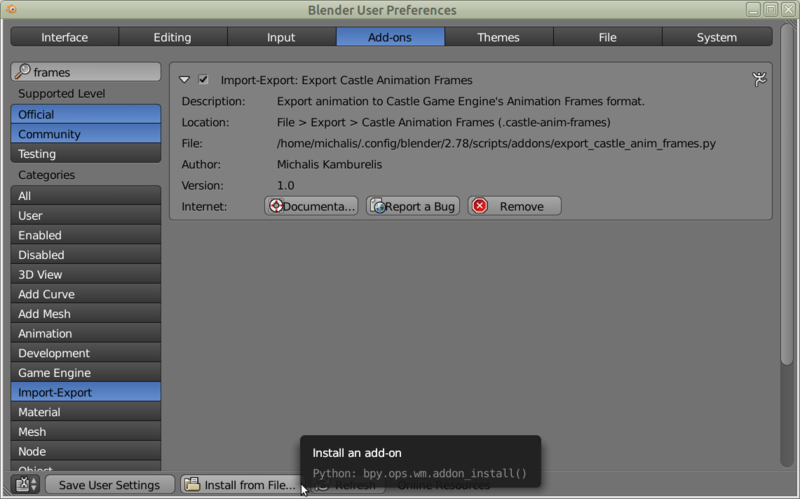 On one hand, it can be used to transfer any Blender animation to Castle Game Engine. On the other hand, it can be quite heavy: loading large animations takes some time, and they eat a significant amount of memory. Some of these disadvantages may be mitigated in the future (as we will internally convert it to better X3D interpolator nodes). But it will always remain somewhat "heavy solution". At the same time, it will always remain something that can handle any Blender animation, right now. As opposed to X3D exporter (that currently cannot export Blender animation at all, and in the future will support a limited subset of Blender possibilities). A temporary disadvantage (TODO) is that right now we do not interpolate at runtime using nice X3D interpolators. Instead, we generate a series of frames at loading, merge the tree when nodes are equal, and move through them using X3D Switch and IntegerSequencer. Once we improve this, the runtime memory usage will be somewhat better, and animation will be always perfectly smooth at runtime, and the collision detection will account for dynamic changes OK.
<animations             // Root node should be "animations". 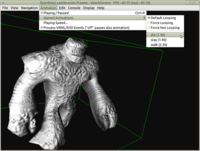 // use "animation" as the root node. <animation              // A single animation. // (default values are shown below). // but more specialized programs (like "The Castle"
// game) may ignore them, since "they know better". // To be used e.g. with TCastleScene.PlayAnimation. // Suggested number of scenes per time to be generated. // animation smoother, but also much more memory consuming. // are "false" and "true", not case-sensitive. // this is not ignored. // A number of <frame> nodes should follow. At least one is required. // you need at least 2 frames if you want a real animation. // other formats supported by Castle Game Engine. // There is also a deprecated attribute "file_name"
// that means the same as "url". // This is understood to be in seconds. // Bounding box of this animation frame. // Used for collision detection. // fields definition e.g. at X3D Group node. // For example, assume that the second <frame> node follows. // file_1.x3d and file_2.x3d in exactly 1 second.